Planned coal-fired capacity additions from a number of countries in and around the Middle East will add 41 gigawatts (GW) of new electric generating capacity over the next decade, based on announced projects and projects currently in the permitting process. Another 3 GW of coal-fired capacity is currently under construction in these countries. About 12 GW of coal-fired generating capacity—or about half of the region’s coal-fired generating fleet—has come online since 2006. Coal capacity in the region is typically less than that of other fuels, particularly compared with liquefied natural gas or petroleum-based fuels, because coal accounts for less than 1% of primary energy production in the region. Turkey is the heaviest user of coal-fired power among these countries with a capacity of approximately 18.5 GW, followed by Israel (4.9 GW) and Pakistan (2.5 GW). Turkey and Pakistan both plan to add more coal capacity over the next decade. Egypt, Oman, Iran, Jordan, and the United Arab Emirates (UAE) have no current coal-fired electricity generation, but they each plan to build coal capacity in the near future. 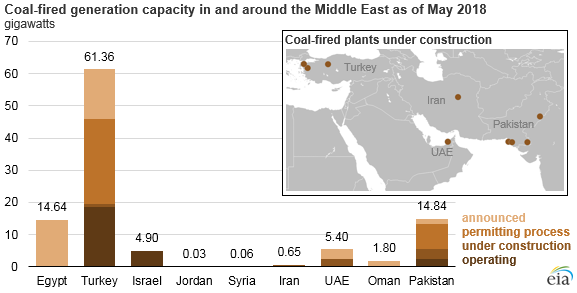 New coal capacity is currently under construction in the UAE, Iran, and Jordan. In addition, Egypt and Oman have announced plans for new coal-fired generators. In the UAE, new coal-fired capacity will come from Dubai’s Hassyan Project. The project consists of 3.6 GW of ultra-supercritical generating capacity, 2.4 GW of which is currently under construction and expected to become operational between 2020 and 2022. Another 1.2 GW was announced for a total of 6 units (with an average size of 600 megawatts (MW) expected to come online in 2023. The $3.4 billion project is sponsored by several investors, including Chinese and domestic banks. According to the UAE’s national energy strategy, generation and emission-reduction targets for 2050 include about 11.5 GW of ultra-supercritical coal plants. These coal plants are required to be compatible with carbon capture and sequestration technologies and to employ highly efficient technologies to mitigate emissions. Ultra-supercritical coal plants use boilers that heat coal to higher temperatures, which increases the pressure of steam to improve efficiency and results in less coal use and fewer carbon emissions than other boiler technologies. Iran’s Tabas power station, sponsored in partnership with MAPNA Group and China’s Shanghai Electric, will provide 650 MW of generation capacity from two units upon completion. The billion-dollar plant, which began construction in 2012, will be powered from locally mined coal. Iran’s domestic coal production is expected to increase by more than 2 million tons per year when improved coal mining and processing facilities begin operation in 2020, according to Imidou mining representatives. Jordan’s 30 MW plant, created based on an agreement between the Energy Ministry and the Al Manaseer Group, will provide power for industrial cement production using coal from the United States, Russia, and Africa. Construction on this plant is expected to begin in July 2018. Oman has announced plans for a 1,200 MW coal-fired power plant and in April began accepting proposals for qualification from developers. In 2017, Egypt announced plans for a $1.5 billion, 6,000 MW coal-fired power plant. This coal plant, which will be Egypt’s first, is expected to be completed by 2024.